Those are the two most important things for progressives to remember about rightwing people, says Chip Berlet. He has tracked U.S. far-right populist movements for the past 30 years, including going to the events of white nationalist groups and the Tea Party. If you want to understand them, and even more if you want to change their minds, you need to remember that they are sane people of normal intelligence who hold a different ideology than you do. Chip’s message advances Class Action’s mission of reducing classism, because stupid and crazy are two common stereotypes about working-class and poor people. In the flawed logic of the American Dream, lack of financial success is due to the individual’s failings. And “dumb” is right up there with “lazy” as to what those failings are presumed to be. Any time I hear words about intelligence, I pause to ask what’s being said about class. In fact, of course, kids born to families of every income level and every race and culture have the same average mental capacity. And it takes a lot of smarts to survive financial hardship and to do many working-class jobs. In the popular imagination, places with concentrated poverty, like Appalachia and poor urban neighborhoods, are imagined to be pits of pathology where rational behavior is rare, everyone is drugged up and mental illness is rife. In fact, of course, these areas have networks of support and ways of coping with poverty that reveal the sanity of most residents. In this month’s media coverage of President Trump’s first year in office, many commentators have had an incredulous tone about the 38% of voters who still support him. After all this? How could they? 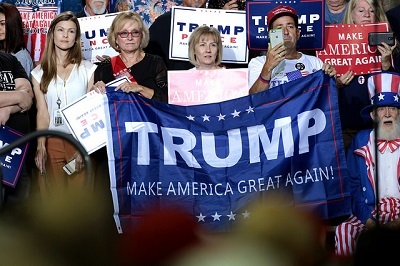 There’s classism in the horrified incredulity – even though Trump’s supporters are in fact class-diverse white people, with more property owners and college grads than low-income workers, according to Jack Metzgar’s demographic analysis, available on the Working-Class Perspectives blog. In fact, working-class white people, the largest race/class category, are politically diverse, spanning the whole left/right range, with most moderately liberal. But the stereotype is that Trump supporters are all working-class whites. And it is troubling how many high-school-educated whites in blue-collar or pink-collar occupations switched from voting for Barack Obama in 2012 to Donald Trump in 2016. In myth to a large extent and in reality to a small extent, there’s an association of Trump supporters with white working-class people. So I’ve been on alert for the classist stupid and crazy tropes in the coverage. “intractable stupidity” and “a cult” was one columnist’s characterization of Trump supporters. “Idiots,” “deplorables” and “sheep” was another’s. How could smart, sane people possibly interpret 2017 as a successful first-year presidency? By cherry-picking points provided by biased media. Trump supporters point out that the economy is growing and wages are rising at long last. The tax bill resulted in instant bonuses for thousands of workers. Yes, we are right to be skeptical about those isolated facts; economic growth started pre-Trump, and the tax bill will be a disaster for working people in the long run. Of course, we’re right to be alarmed about rising racism, threats to immigrants, impending environmental catastrophe, transphobia and sexual predators in power, the risk of war and how the plutocrats have hijacked democracy. But it’s not just our political opponents who have confirmation bias, noticing and remembering whatever fits our ideological frames. We progressives do it too; all humans do. Those diehard Trump supporters have been manipulated by Fox News and the other rightwing outlets. But it’s true of all of us that some of our views come from the media we’ve consumed. Most members of white nationalist organizations stay involved for only six months, says Rafe Ezekiel in The Racist Mind. During years of his research embedded with hate groups, he personally helped some young adults get out of the hate groups and into more constructive communities. Respectful engagement with someone offering a different worldview is the context in which people shift their frames. Our task of telling a compelling story that conveys our progressive frames will succeed best when it’s done face-to-face and with awareness of the underlying values of the old frame we’re trying to supplant. Ideologies morph over time. People change their minds. The people who horrify us, whose votes brought this catastrophe upon our land, they’re regular human beings. We demonize them at our peril.